You’ve seen it on Instagram, Pinterest, and heard about your friend’s incredible backpacking trip to see the blue-green water of Havasu Creek. Havasu Falls is one virally famous and incredibly difficult to get to. These beautiful waterfalls are at the bottom of the Grand Canyon in Arizona and require a 10 mile hike each direction just to see them! 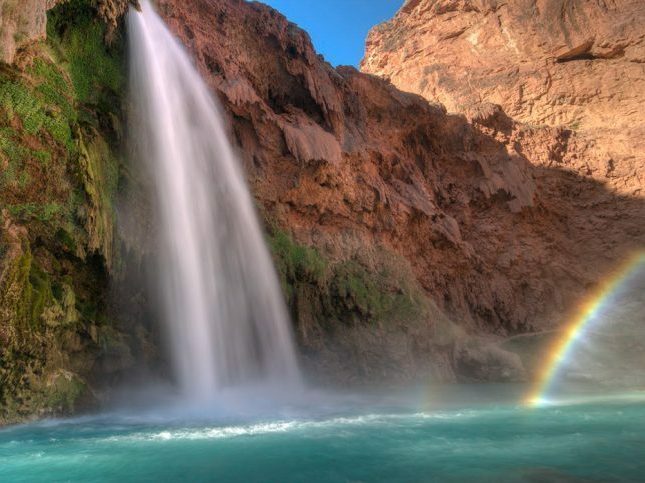 Travel Channel has named Havasu Falls one of America’s Best Secret Swimming Holes. **Note, this website is not the official website of the Havasupai Tribe. If you want to reserve a permit for yourself, you will need to contact the tribe directly: http://theofficialhavasupaitribe.com. A quick Google image search of Havasu Falls will turn up thousands of stunningly beautiful results, each showing the cascading water from a different and unique perspective. It is surprising to many that these falls can be found beneath the rim of the wide expanse of the Grand Canyon that boasts more than 5 million visitors each year. How could they go so unnoticed? Though these falls are within the geographic region of the Grand Canyon, they are outside of the boundaries of the National Park on the Havasupai Indian Reservation, and are very difficult to access (see below for how to get to Havasu falls). The Havasupai Reservation is home to the Havasupai Tribe, a group of native peoples who have made their home throughout the canyon for over 800 years. They take their name from the distinct hue of the creek that runs through Havasu Canyon – the Havasupai, people of the blue-green waters. More than 500 tribal members still live in the canyon in the village of Supai, Arizona; a town only reachable by a dusty 8 mile trail on foot or horse, or by helicopter. Visiting Havasupai is not easy, all visitors require a permit. Once you have your permit, contact us to get outfitted with all the gear and food you’ll need for your self-guided Havasu Falls hike. Permits typically sell out within a few hours when they become available each year on February 1. Take a look at our blog on How To Get Your Havasupai Permit. To get to the Havasupai trailhead, take Interstate-40 to Seligman, AZ, head west about 30 miles on AZ-66 to Indian Road 18, Follow Indian Rd 18 60 miles to Hualapai hilltop parking lot to begin the hike. The hike into Supai, Arizona, the only town on the Havasupai Indian Reservation, is 8 miles on a dusty trail either on foot or packhorse. There is one lodge in Supai Village that is available for tourists. About 2 miles outside the Village is Havasu Falls and the Havasupai campground where most visitors choose to stay. The campground is about ¾ of a mile long with undefined camping spots available as first come – first served. AOA offers 4 mule-supported trip options. All follow the same trail into Havasupai, beginning on the canyon rim at the Hualapai Hilltop and descending to hike along the floor of Grand Canyon as the red sandstone walls rise high above. The “Ultimate” explores the National Park before turning to Havasupai. On the 5-Day hiking trip, packhorses carry all gear including your personal items, allowing you to carry only the water and small items you need for the trek into the canyon. The 3-day Escape and 4-day hiking trip options are also mule-supported, where all camp gear, food, and extras are carried in on horseback, but you are responsible for carrying your clothes and sleeping bag, making the shorter trips somewhat more difficult. 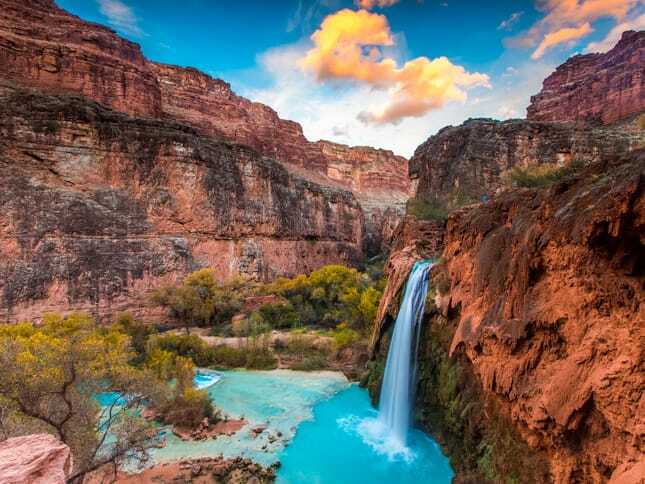 In every case, you will camp comfortably beside the clear blue waters of Havasu creek, and spend your days swimming or exploring the waterfalls of Havasupai with your experienced guides. 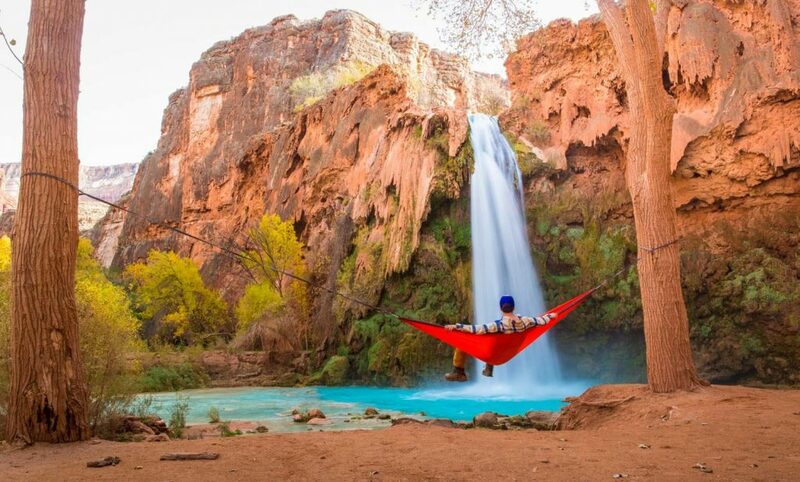 Taking a camping trip to Havasu Falls is an epic vacation you have to do at least once in your lifetime. Disconnect from our busy, material-obsessed world and rely only on yourself, the experience of your professional guide, and whatever you can carry on your back. Don’t have the gear? AOA can provide everything you need for this Havasu Falls Backpacking trip.